Jennifer MacKenzie is an agricultural photo journalist with almost 30 year's experience. Operating from her base in Cumbria, Jennifer undertakes mainly industry-related freelance writing and photography. 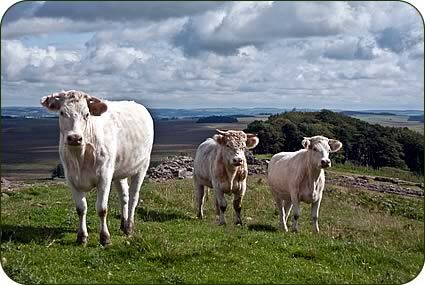 Traditional Blue Grey cattle have fared well for four generations of a Northumberland family whose upland farm straddles Hadrian’s Wall. Galloway cows have been crossed with the Whitebred Shorthorn to produce the hardy Blue-Greys for more than 60 years at the tenanted Sewing Shields near Haydon Bridge which runs from 750ft to more than 1,000ft above sea level, taking in limestone outcrop, peaty ground and the Whin Sill which the line of the famous Roman Wall follows, and bordered by Kielder Forest to the north. 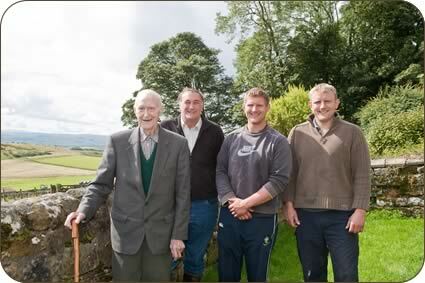 The Whitebred Shorthorn was first introduced to the farm by William Tully, great grandfather of the fourth generation to farm there - Jamie and Andrew Murray with their father Angus and grandfather, Alastair. William was one of the Whitebred Shorthorn breeders who founded today’s breed society 50 years ago when 201 males and 506 females from 134 herds were entered into the first herd book. However the breed dates back to the early 1900s. Despite losing all their cattle and the majority of their prized pedigree Blackface sheep in 2001’s foot and mouth epidemic, the family maintained the traditional breeds which suit the farm and which they believe could play an important role in the future with agriculture facing ever rising input costs. Today’s herd of 65 Galloway females, the majority of which are registered, have been bred from a herd of 40 cattle bought from the Isle of Mull, along with purchases of individual animals. 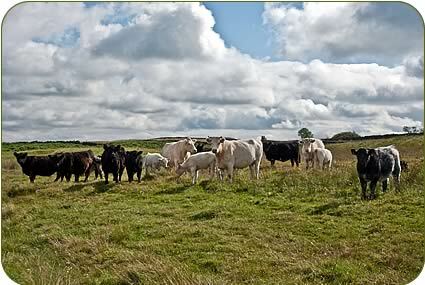 The small Sewingshields Whitebred Shorthorn herd was re-stocked with heifers from Allensgreen and High Thorneyburn. 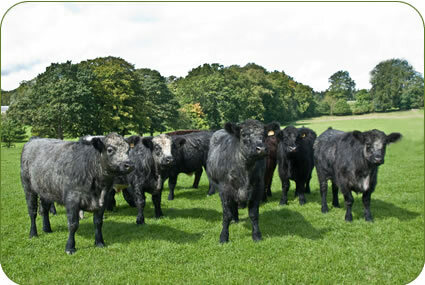 Fifteen of the Galloways are bred pure and heifers are kept as herd replacements, with the remainder being crossed with the Whitebred Shorthorn to produce the Blue Grey calves, all of which are sold. “The cattle work very well for us as we outwinter all the breeding females which are just fed silage with no other costs such as straw for bedding or artificial fertiliser,” said Angus. The spring calving cows teach their calves to forage. At around six months old the heifer calves are sold straight off their dams at the annual Newcastleton two day sale to farms the length and breadth of the country many of which will be used as hardy suckler cows on upland and marginal units, crossed with continental or Aberdeen Angus bulls. At last year’s Newcastleton sale, held in the last week in October, six month old females sold to £400 a head with prices more than £100 higher the previous autumn. This year they are optimistic about prices for their entry on October 25 and 26 at the Scottish border venue. “We are limited as to what we can farm at Sewing Shields and we have considered running continental type cattle here but decided to stay with traditional breeds,” said Jamie. “It can be very harsh and it would have taken a massive investment to do anything different and winter cattle inside. But it has not been necessary because this works for us, especially now that the cost of feed has increased.” he added. The farm runs to 2,000 acres with only 100 acres suitable for mowing for silage. The rest is rig and furrow pastures, rough grazing and peaty ground with crags and mosses. The Murrays were among the first to enter Higher Level Stewardship because of the farm’s contribution to the environment and that the wall - a World Heritage Site - crosses it. The Hadrian’s Wall footpath and the Pennine Way bring thousands of walkers across the farm each year. As well as being steeped in Roman history, the farm has other famous links from the past, taking its name from a former castle with seven turrets which features in Sir Walter Scott’s poem, Harold the Dauntless. Despite the Galloways, Whitebreds and Blue Greys being environmentally-friendly cattle, encouraging the growth of smaller plant species as non-selective grazers and minimising poaching because of their lighter weights, a traditional breeds grazing supplement was not an option for the Murrays at the time of joining the HLS. The native British breeds suitability for environmental schemes is helping to increase their popularity, as well as the quality of their largely grass-produced meat and their ease of management. So far, the Blue-Grey has not been accepted for the supplement because it is not a registered breed but a cross, although some registered breeds which have evolved more recently are accepted. Angus Murray is chairman of the recently-formed Blue Grey Group who is working with Karen Telfer of Hole O’Lyne, to gain status for the Blue Grey which, in turn, would help to promote its parent stock, the Galloway dam and the Whitebred Shorthorn sire. The Blue Grey inherits the milking qualities of the Whitebred Shorthorn, as well as longevity producing mainly polled calves well into their teens of years, and being easily managed. With 220 breeding females across 31 pure bred herds in the UK, the Whitebred Shorthorn has moved from the Rare Breed Survival Trust's Critical species list to its Endangered category. The Whitebred Shorthorn Association is convinced that the breed has a bright future producing a great cross with Highland, Aberdeen Angus, Welsh Black, Simmental as well as Holsteins and Ayrshires. “We believe these native breeds have a great potential because of rising input costs,” said Andrew. “You would struggle to get a better cow to put on a hill to raise a good continental cross calf with the minimum of inputs. “As the world population grows it is likely that cattle will come back to the hills and be profitable with fewer inputs as lower ground is used for crop production,” he added. Finishing cattle at Sewing Shields is not an option but for the last two years rented ground at Newbrough, closer to Haydon Bridge in the Tyne Valley, has enabled the Murrays to take their steers to strong stores or finished. 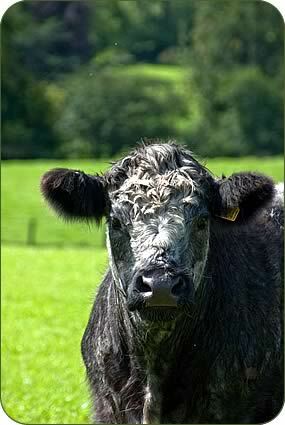 A bunch of bullocks were sold in mid August at Longtown, making between £870 to £950 a head. Buildings on the 100 acres enabled the bullocks to be wintered inside on silage. The hardy Blackface ewes are also promoted by the Murrays who fly the flag at numerous shows in the north having won the championship many times over the years at the area’s premier sheep show, the Roman Wall Show. The 1,100 ewe flock was traditionally Northumberland type Blackies but now they include Scotch types. With 480 Scotch types and 440 Northumberland types bred pure, the remainder are crossed with home-bred Bluefaced Leicester rams for Mule production. In the last decade shearling rams have sold to £2,400 at the annual Hexham sale, the ram going on to breed a £10,000 tup for purchasers Robert Raine, Townfoot, in October last year. Scotch type sheep are also being sold at Lanark. Thank you for visiting JenniferMacKenzie.co.uk - Come back again soon. © Copyright 2005 - 2018 Jennifer MacKenzie All Rights Reserved.